Only 12 examples will be made bearing the Super Bowl star's signature. Super Bowl star Tom Brady was to realize his dream of creating the ultimate Vanquish. That project has now come to fruition with the reveal of the (deep breath) Tom Brady Signature Edition Aston Martin . 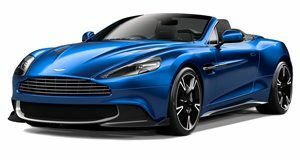 Brady worked with the automaker’s Q by Aston Martin bespoke division to create the unique Vanquish S, which has been branded with the footballer’s signature on the sill plates and a TB12 logo on the headrests and fenders. Limited to just 12 examples, the bespoke is finished in an Ultramarine Black exterior complemented with a Dark Knight interior. “It was an easy decision to go with the Vanquish S for the special edition - it is an incredible car to drive and is truly a work of art,” said Brady. “Going through the process of curating a unique Aston Martin has been fascinating. We started with a blank canvas and finished with this beautiful car. It’s been great to see it all come to fruition and I’m proud to share a name with it. I hope you enjoy it as much as I do!” Brady also worked closely with Aston Martin’s Chief Creative Officer Marek Reichman who commended Brady’s taste in supercars. “'Q by Aston Martin – Commission’ is the ultimate in bespoke, in fact it can even go as far as creating an entirely new car,” said Reichman. “Tom chose the Vanquish S as he recognizes natural athletic performance when he sees it. He has curated a beautiful, tailor-made car that will excite its owners for many years to come.” The Tom Brady-branded doesn’t offer any mechanical upgrades over the standard car, which is powered by a naturally aspirated 6.0-liter V12 producing 580 hp. Instead, carbon fiber has been used extensively throughout the supercar along with other “performance” materials. Brady also appreciates Aston Martin’s meticulous attention to detail, which is why the steering wheel has California Poppy leather paddle shift tips and is color-keyed to the Aston Martin One-77. Being associated with a footballer, it’s not surprising that the bespoke convertible is extremely expensive, with an eye-watering price tag of $360,000. Deliveries of the Tom Brady Signature Edition Aston Martin are expected to commence in Q1 2018.